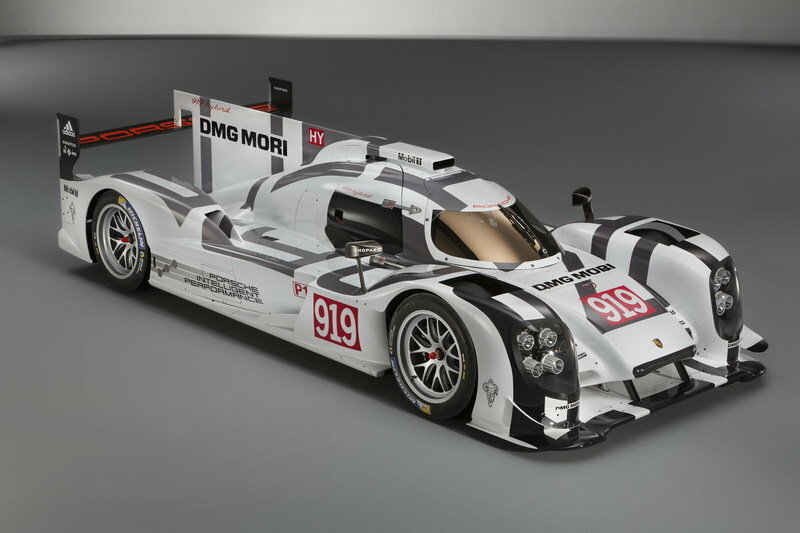 Porsche has revealed its newest 919 Hybrid racecar. Check out all of its details at TopSpeed.com. Even though it didn’t manage to end the Audi tyranny at the 24 Hours of Le Mans, the Porsche 919 Hybrid is still very much on a mission to bring the Stuttgart sports car builder back where it belongs in the LMP1 class in endurance racing. Having been launched in 2014, a second generation of the model, with many improved parts, began testing on the 18th of January at the Abu Dhabi Yas Marina Circuit. 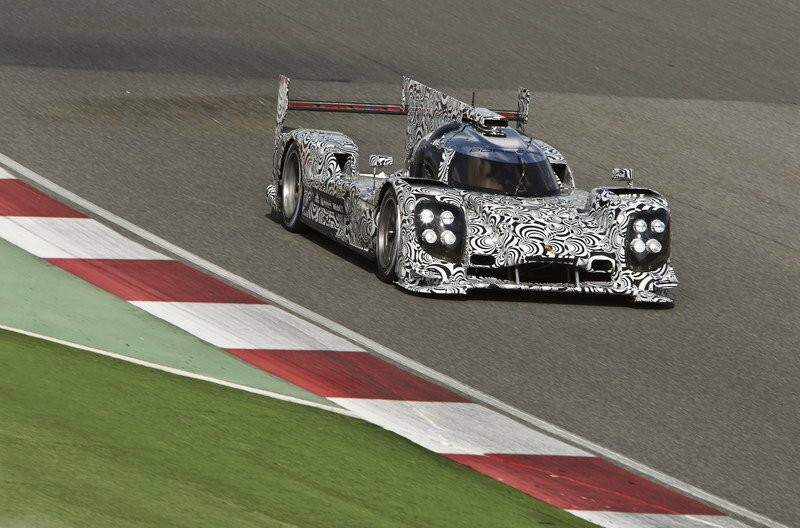 The improved 919 Hybrid actually had a successful initial roll-out right at the Weissach test track near Porsche’s headquarters, on December 15, 2014, with the test in Abu Dhabi being the first of plenty more to come before the World Endurance Championship (WEC) season opener takes place at Silverstone, on the 12th of April 2015. Despite having a nearly identical exterior and being powered by the same power unit as the 2014 model, the 2015 919 Hybrid has been improved in a reasonable amount of areas, but for obvious reasons not all the upgrades are currently public. Since in endurance racing the main focus is not necessarily on fast lap times but on efficiency and reliability, most of the improvements are expected to have been made on the turbocharged , hybrid, V-4 engine that power the model. 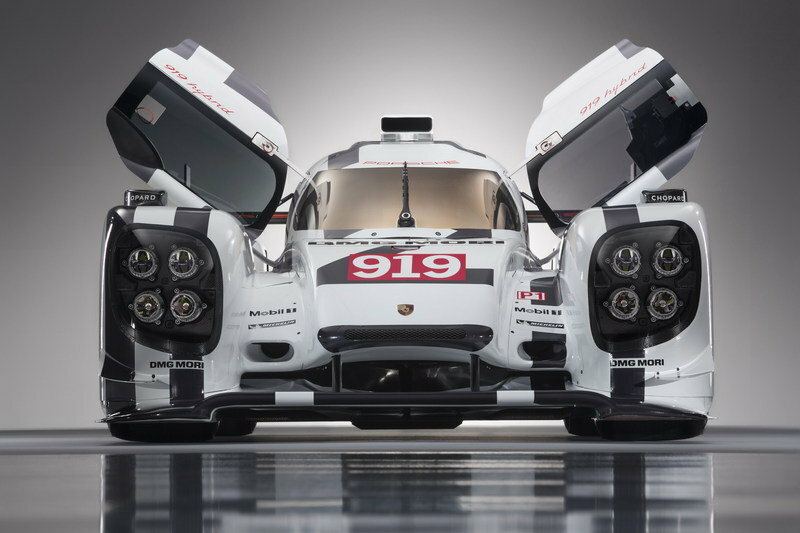 With that being said, the 919 Hybrid also benefits form an aerodynamic upgrade that changes quite a lot of details on the car’s look, especially at the front. Porsche actually says that the 2015 WEC challenger is an all-new design based on the same concept as the 919 Hybrid that ran during 2014. Updated 01/16/2015: Porsche announced that the 2015 Porsche 919 Hybrid began its extensive testing session at the Abu Dhabi Yas Marina Circuit. After that, the car will take several performance and endurance tests before the WEC season opener on April 12 in Silverstone, Great Britain. 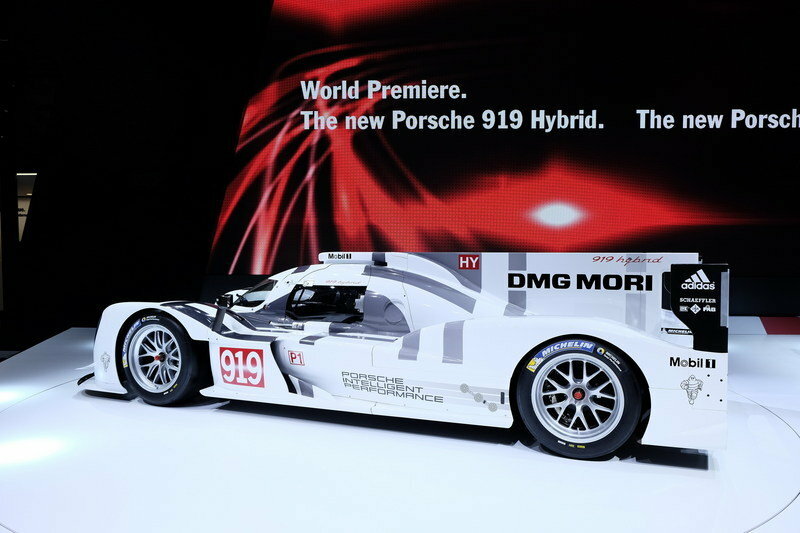 Click past the jump to read more about the Porsche 919 Hybrid and the company’s history at Le Mans. 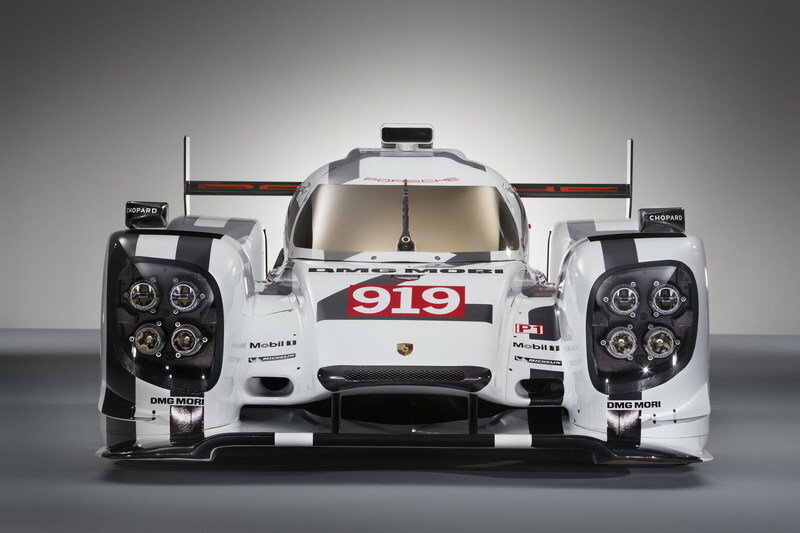 While at first glance it may not look like the new Porsche 919 Hybrid is that much different except for its change of color from white to naked carbon fiber, a number of aerodynamic upgrades become obvious once you get closer. The front end is where most of the restyling has been done, with the model now featuring a single and very wide air intake that connects the redesigned headlights assembly. Speaking of which, the four LED headlights are back on each side, while the front canards have been slightly reshaped. The nose is no longer a boring rectangular but now v-shaped, giving the car more of a beak-like front end instead of looking like a surprised duck. Moving to the side, a new aerodynamic fins have moved toward the rear wheels, most likely to be used in part by the hot air exiting the front brakes. Obviously, the interior of the 919 Hybrid is mainly off-limits to photographers, but a mixture of carbon fiber, buttons and switches are expected to adorn the center console, while the single carbon-fiber seat should be engulfed in Alcantara and fire-retarding material. 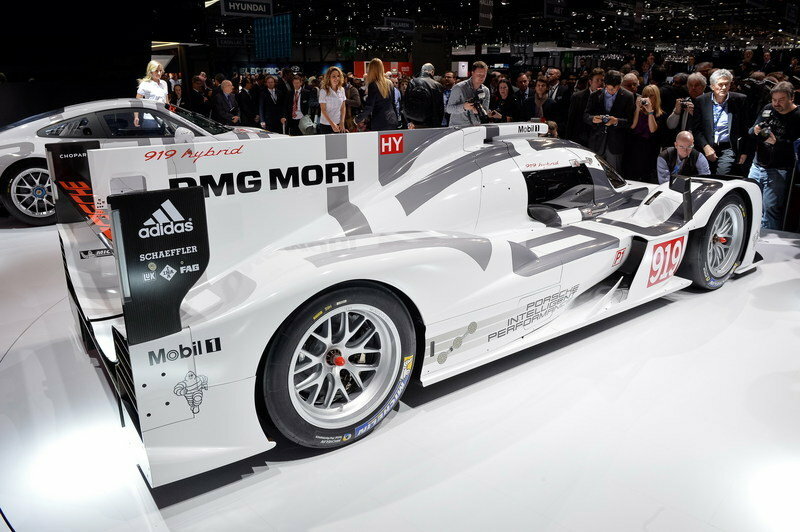 Just like the model that finished third in the World Endurance Championship (WEC) in 2014, the new Porsche 919 Hybrid is also built around a carbon-fiber monocoque with a honeycomb aluminum core. It is powered by a 2.0-liter, turbocharged, V-4 engine that is paired with an electric motor, two energy-recuperation systems and a lithium-ion battery pack. Thanks to the electric motor powering the front wheels, the model is essentially all-wheel drive on demand. More details about its improved powertrain should become official by the time that the 2015 WEC kicks off in April. 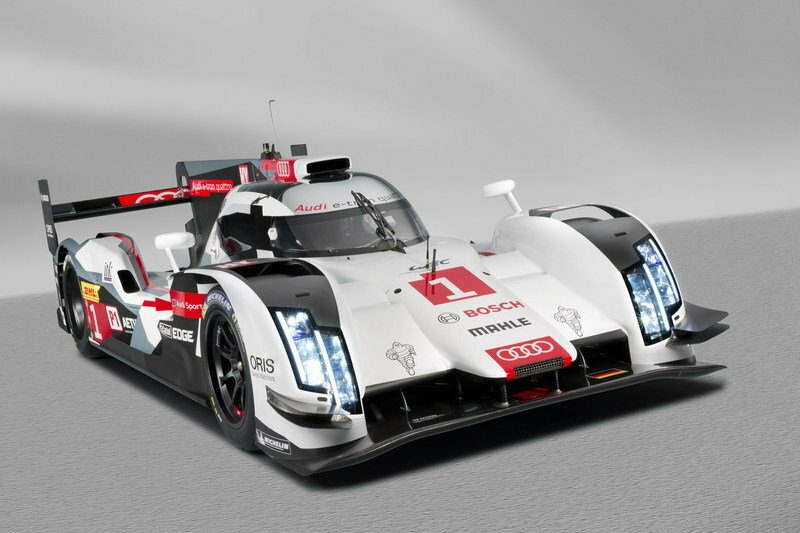 While not officially confirmed to run in the 2015 championship, the Audi R18 E-Tron Quattro is what many see as the nemesis for the Porsche 919 Hybrid, with the Ingolstadt carmaker having won no less than 13 times at the 24 Hours of Le Mans. Powered by a twin-turbocharged, 4.0-liter V-6 that exclusively transmits power to the rear wheels via a seven-speed sequential transmission, the Audi R18 is also augmented by an electric motor, a lithium-ion battery and an energy recuperation system. 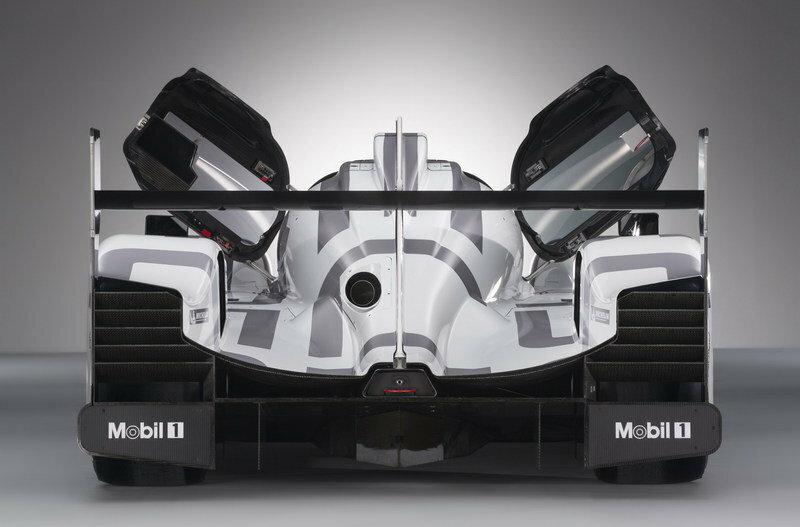 Currently, the model is the only car in the LMP1 category to still use a diesel powerplant as the main type of propulsion, giving it a torque and fuel economy advantage compared to most others. By far the most powerful car in LMP1, the Toyota TS040 Hybrid came reasonably close to turn the tides on Audi’s recent dominance at Le Mans, but a number of crashes and some reliability problems only saw it clinch the third position in the 24-hour race. Unlike its rivals, the TS040 Hybrid is powered by a naturally-aspirated, 3.7-liter, V-8 engine, that is paired with not one but two electric motors. With a maximum output of 986 horsepower sent to all four wheels, the Japanese racing model should remain a true opposing force to both the Audi R18 E-Tron Quattro and the Porsche 919 Hybrid, both of which rely mostly on efficiency and reliability and not all-out grunt. By far the most prolific constructor in motorsport and with the most wins at Le Mans 24 Hours, Porsche is putting all its money on the redesigned 919 Hybrid and hopes that it will finally bring the LMP1 trophy back to Zuffenhausen. With recent reports suggesting that the sports car builder may actually field three cars at the 2015 edition of the classic endurance race, its reliability problems from 2014 may soon be forgotten. 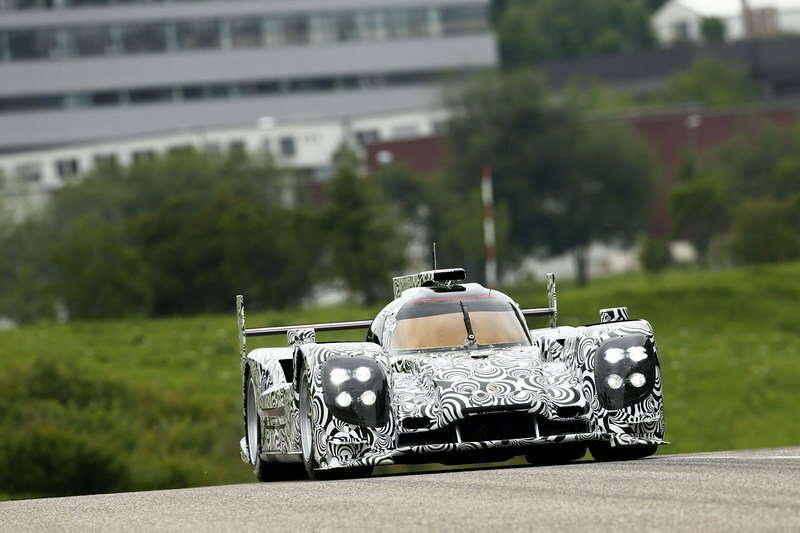 Considering that the first variant of the 919 Hybrid wasn’t actually a slouch in most races, the 2015 model should be even better and its chances of finally beating Audi are increasing. Lying at the heart of the 919 Hybrid is a 2.0-liter V-4 (Yep, a V-4 engine) that produces an amazing 500 horsepower and revs to a head-spinning 9,000 rpms. The direct-injected, turbocharged engine also serves as a structural component of the chassis, enabling engineers to keep the its overall weight down. Additionally, two separate energy recovery systems are on board. Up front is a motor mounted on the front axle that utilizes regenerative braking. The second system is a little more unconventional and futuristic. 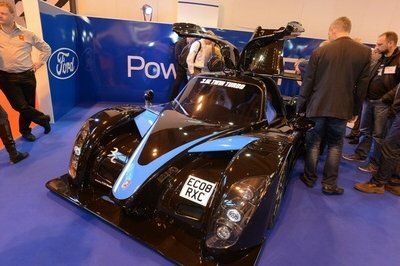 It uses thermal energy collected from the exhaust system to power a generator. The power from both systems is stored in water-cooled lithium-ion battery packs. When the driver needs the extra power, the energy is sent to the front electric motor, powering the front wheels. This essentially makes the 919 all wheel drive. The 919 is certainly a crowing achievement for Porsche as it represents a nearly all in-house development, and the latest batch of info from Stuttgart confirms that notion. 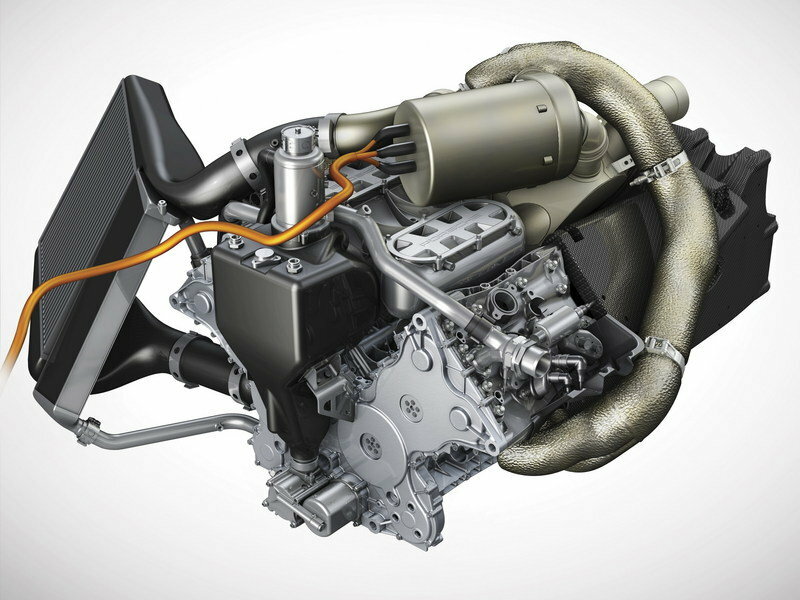 With the regulations for the LMP1-H category only regulating the hybrid system and how much fuel is consumed during a lap, the engineers were able to design and developing their choice of engine design, its displacement, and the method in which the regenerated electricity is stored. With the 919 registered in the six megajoule category, the engineers had to develop the system to use exactly 1.67 kWh of energy per every eight miles. 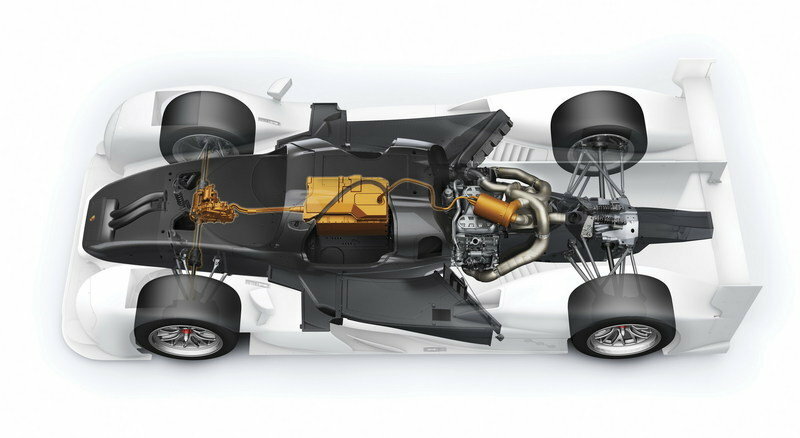 With all the onboard regenerative equipment, the 919 is able to generate 581.2 kWh – more than enough to power the car. Porsche also makes an example of that amount of energy powering a Volkswagen e-Golf from New York to Los Angeles. The hybrid system is comprised of several regenerative components that send power to be stored in the water-cooled lithium-ion battery pack On the front axel lies a Kinetic energy recovery system and on the V-4 engine is bolted a secondary turbocharger-like generator. The KERS works by collecting rotational energy and converting it into electricity. In the same respect, the engineers mounted a small turbine generator to the main turbocharger’s wastegate valve. Anytime the wastegate opens to dump excess exhaust pressure, the turbine generates power. With the 500-horsepower, turbocharged V-4 engine and the hybrid drive system working together, the car gives the driver similar power to a conventional racer, but uses 30 percent less fuel. Porsche’s overall main goal with this technology is to perfect it on the racetrack in order to include systems like these on regular production vehicles. The highly-publicized 918 Hybrid hypercar is the Porsche’s first example of what this sort of technology can do for sports cars. 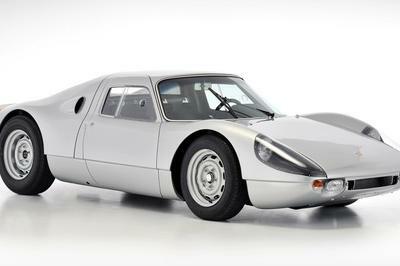 Porsche made its first appearance in the Le Mans race in 1951 and since then it was the maker with most of the wins. 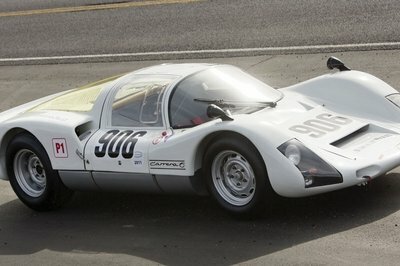 There were more than 600 Porsche vehicles entered in the race and the company has tallied 16 overall wins (1970, 1971, 1976, 1977, 1979, 1981, 1982, 1983, 1984, 1985, 1986, 1987, 1994, 1996, 1997 and 1998) and 94 class wins with prototypes and GT vehicles. The first win was obtained in 1951 with a 356 SL Coupe and the latest one in 2007 with a 911 GT3 RSR entered by French private team IMSA Matmut. Matthias Müller, Chairman of Porsche AG: "Crucial in the development of the Le Mans prototype were the newly created and revolutionary racing rules for this class as they relate to energy efficiency. 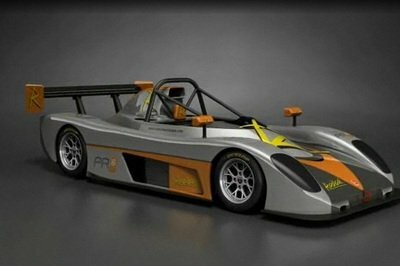 In 2014, it will not be the fastest car that wins the World Endurance Championship series and the 24 hours of Le Mans, rather it will be the car that goes the furthest with a defined amount of energy. And it is precisely this challenge that carmakers must overcome. 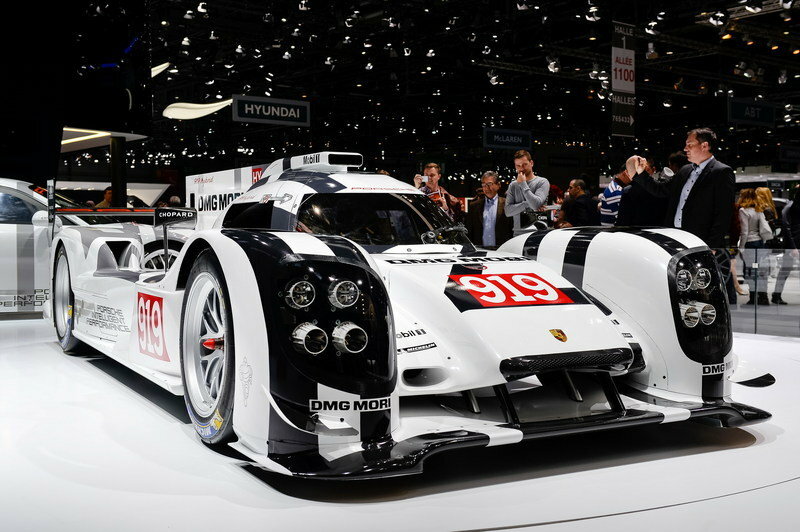 The 919 Hybrid is our fastest mobile research laboratory and the most complex race car that Porsche has ever built." In addition, the Le Mans prototype has two energy recovery systems. Fundamentally new here is a system that recovers thermal energy from exhaust gases via an electric generator driven by the exhaust gas stream. The second hybrid system has the functionality familiar from the 918 Spyder. Here, a generator on the front axle utilises braking phases to convert kinetic energy into electric energy. Lithium-ion batteries serve as the energy storage medium. When the driver needs this energy, an electric motor drives the front axle. 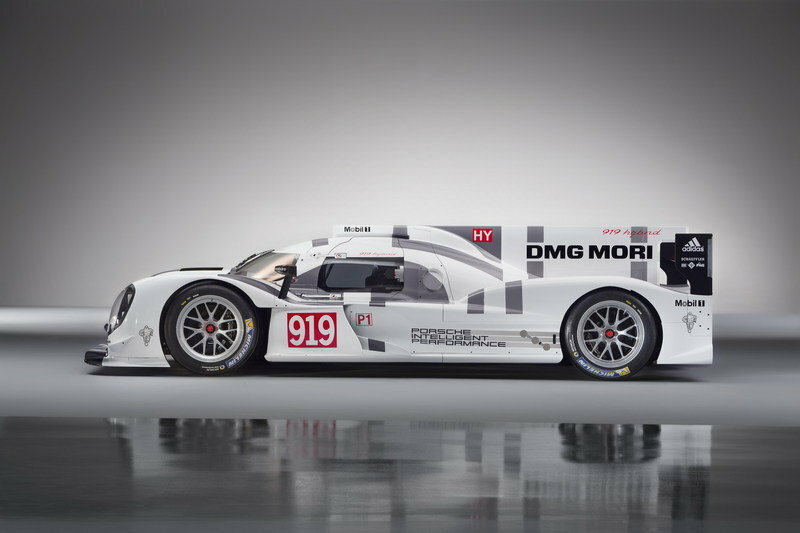 This makes the 919 Hybrid an all-wheel drive vehicle temporarily. A new Porsche team of over 200 employees was formed to develop and implement the Le Mans prototypes at the development centre in Weissach. Friedrich Enzinger, Head of LMP1: "Within two and one half years we built the infrastructure, assembled our team and put this highly complex race car on wheels. We have the greatest respect for the lead our competitors have in racing experience. Our objective in the first year is simple: to finish races and be competitive." 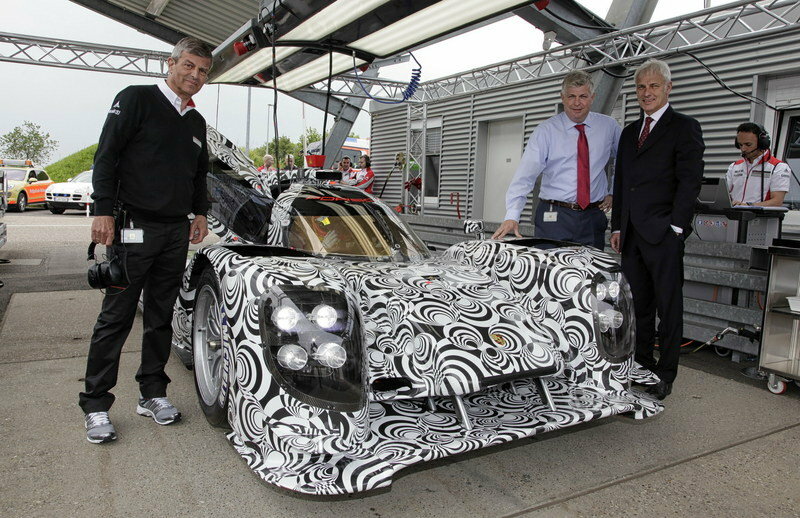 The new Porsche LMP1 sports prototype, which will compete in the sports car World Endurance Championship (WEC) and in the 24 Hours of Le Mans from 2014, successfully completed its first rollout today on the Porsche test track in Weissach. Before the eyes of the entire Board of Porsche AG, Porsche works driver Timo Bernhard took his new ‘wheels’ through its initial function check. Since the decision in mid-2011 to return with the LMP1 racer to top motorsport as a works effort, the Motorsport Centre at Weissach has grown significantly. A workshop and an administration building were built and accommodate around 200 employees who are responsible for the design, assembly and deployment of the LMP1 car. From the 2014 season, the racer will be fielded by a Weissach-based works squad. “I was involved in the development of the new car right from the outset,” says Porsche works driver Timo Bernhard. “I’m very proud that I was the one to take our baby through its first paces today. Already now the car feels great. I look forward to testing the vehicle in the coming weeks and months with my friend and colleague Romain Dumas.” Bernhard (32) and Dumas (35) are the first two regular drivers in the LMP1 project and will carry out the majority of testing on various international circuits. 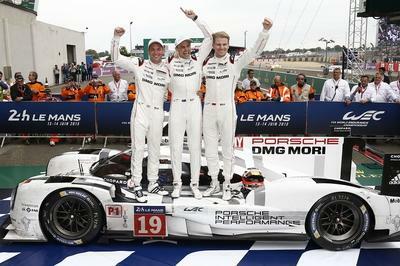 The return of Porsche to the top LMP class of the World Endurance Championship (WEC) presents significant challenges. 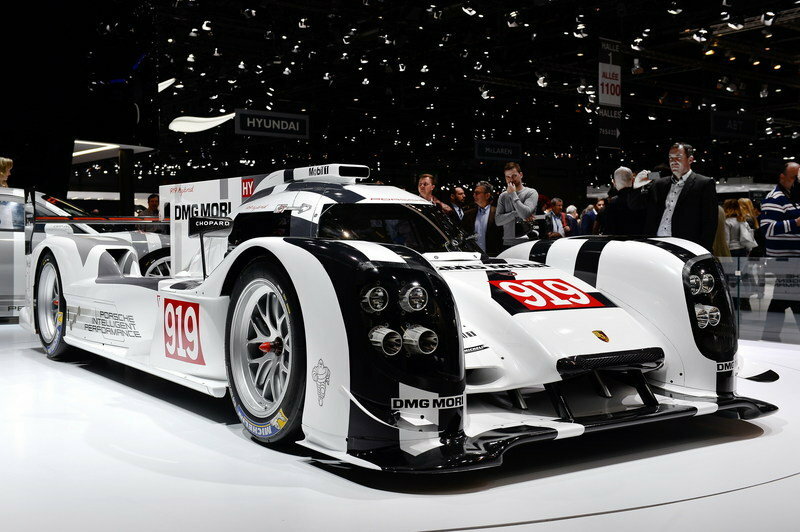 Firstly, the new 919 Hybrid is the most complex racing car the Stuttgart sports car manufacturer has ever built. Secondly, unlike the competition, Porsche does not have experience or data to refer to from previous years’ racing at the top level (outside the GT category). And, thirdly, Porsche used its own engineers develop the prototype in its newly-set up LMP1 racing team – a significantly more difficult, but in the long-term more promising, route than buying existing components from other companies. In this endeavour, Technical Director LMP1 Alexander Hitzinger and his team are pursuing a proven path that has a long tradition at Porsche: finding solutions which may benefit series production customers in the future. The search for the optimum energy conversion efficiency – ie the best possible ratio between supplied and utilised energy – is massively influencing every aspect of the Porsche 919 Hybrid, the aerodynamics of the Le Mans race car, as well as the weight-optimised individual components. However, the highly advanced energy recuperation and drive systems are two of the outstanding features in this regard. The revolutionary new technical regulations of the WEC for the 2014 season gave the specialists at Porsche a great deal of freedom. A limiting factor for the performance of the car is primarily the amount of fuel available per lap. This approach makes energy efficiency a primary factor. 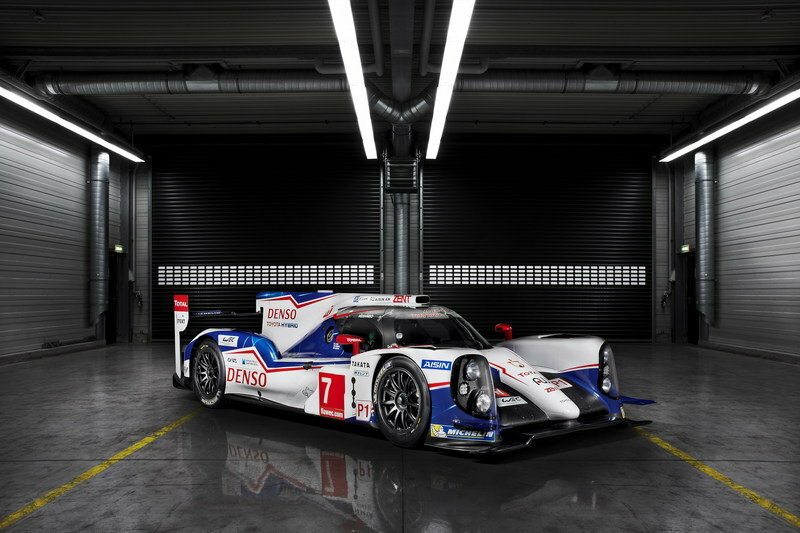 Meanwhile, a hybrid system is also a pre-requisite for the factory cars starting in the LMP1-H category. The rule-makers have left the type and method of storing the retrieved energy up to the constructor as well as the choice of engine design and the displacement. The amount of electrical energy each driver can use per lap at Le Mans delivered as a boost is limited. The rules specify four classes of energy levels ranging from 2 to 8 megajoules (MJ). Porsche has registered the 919 Hybrid for the 6 megajoule category, which means that the LMP1 prototype can use exactly 1.67 kilowatt hours (kWh) of energy per 13.629 km (8 mile) long lap on the "Circuit des 24 Heures", since 3.6 megajoules is equivalent to 1 kilowatt hour (kWh). But what does this mean in real terms? In 2013, the Le Mans winner covered 348 laps. Calculated over the same distance the new 919 Hybrid generates and uses 581.2 kilowatt hours (kWh) – an electric output which would run a 60 watt light bulb for a staggering 9,687 hours. Or in other words, with the energy the LMP1 Porsche prototype recuperates during the Le Mans race you could cover 4,576 km in the most efficient electric car that is currently available in the compact class, the new Volkswagen e-Golf – which would take you across the USA from coast to coast, from New York to Los Angeles. "The recuperation of kinetic braking energy at the front axle has great potential with the axle load being dynamically shifted to the front when you brake, so a system that exploits this was a logical step," explains Alexander Hitzinger. "In favour of this solution we gave up a KERS on the rear axle. If you start with a naturally aspirated engine, KERS is the only option you have. But using turbocharging gave us another option, which is why we opted for using the energy from exhaust gases from the turbocharger." The complex hybrid system in the new Le Mans prototype with its highly innovative recuperation of thermodynamic energy from exhaust gases is unique in the WEC. This principle basically uses an extra turbine generator unit instead of what is called the wastegate. This valve normally allows excess energy from exhaust gasses, that are not required to drive the compressor, to escape into the atmosphere. Porsche utilises this excess energy from exhaust gases; it drives a second turbine, which in turn drives a generator that produces electrical energy. The new technology recuperates energy that has always been lost in other systems. This use of energy from exhaust gases makes the Porsche 919 Hybrid the only car in the field that recuperates energy not only when it brakes but also when it accelerates. Both systems direct kinetic and thermal energy converted into electrical energy back to a liquid cooled lithium ion battery. Porsche has also made its own way in its method of storing electrical energy. Here the same premise was applied, so, instead of drawing on less effective but readily available systems, Porsche decided to exploit promising technologies and in this case liquid cooled lithium ion batteries. "Developed in co-operation with Porsche Engineering," stresses Hitzinger, "so this know-how benefits future hybrid vehicles." Hitzinger also looked into flywheel storage and super-capacitors, so called ‘ultracaps’, but found lithium ion batteries to be the best compromise. "But only if," he adds, "the right cell technology is available to provide a very high power density with relatively high storage capacity." 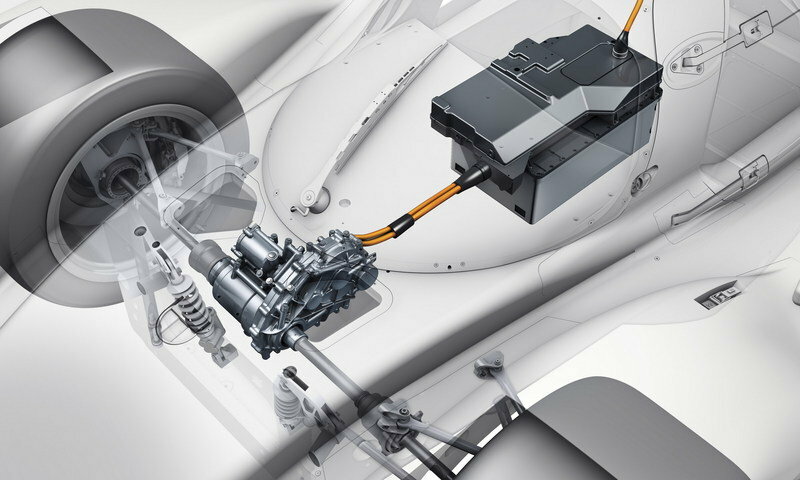 To achieve this Porsche puts its faith in battery cells from its partner A123 Systems. The approach Porsche has used for the combustion engine is just as unique. The newly-developed V4 turbo with two litre engine displacement and direct injection – a system that is atypical for Porsche – is a pioneering example of downsizing. The four-valve engine represents the ideal combination of low weight and compact size with structural rigidity and high power output. Since Porsche is starting in the 6-MJ class with the 919 Hybrid, the rules allow the petrol engine with over 500 hp a consumption of only 4.78 litres per lap in Le Mans. The more powerful the recuperation system, the less fuel may be burnt. Although the driving performance is the same, the permissible amount of energy is 30 per cent lower than last year. This year’s calendar for the FIA WEC (World Endurance Championship) involves eight races. After the six-hour opening races in Silverstone in the UK and the "Ardennes roller-coaster" of Spa-Francorchamps, the third World Championship race is truly outstanding. The legendary 24 Hours of Le Mans is both the highlight of the season and a unique challenge. Much of the 13.629 km "Circuit des 24 Heures" track – nine kilometres of it – runs over closed country roads which are usually open to commuters and heavy goods vehicle, leaving behind grooves in the surface. Also characteristic for Le Mans are long straight straights. The LMP1 factory cars reach speeds significantly higher than 320 km/h (200 mph) several times during each lap, and twice they have to decelerate to urban traffic speeds at slow turns – by day and night – while the engines are on full throttle for about 70 percent of the lap. The hard braking phases and prolonged powerful acceleration around the Le Mans circuit led Porsche to develop the temporary all-wheel drive 919 Hybrid with its kinetic and thermodynamic energy recuperation systems for these specific conditions. The finely balanced aerodynamics of the vehicle also play a decisive role in making the 919 Hybrid competitive in Le Mans. The resulting downforce values guarantee excellent speeds in fast corners, such as the ‘Porsche Curves’. Opposed to this are the lowest possible air resistance values so that the 919 Hybrid can reach maximum speeds over the long straights. After the racing festival in the French Sarthe department the WEC is taking a three-month summer break, and then it will leave Europe for the rest of the season. The programme includes five more six-hour races: USA (Austin, 20 September), Japan (Fuji, 12 October), China (Shanghai, 2 November), Bahrain (Sakhir, 15 November) and Brazil (Sao Paulo, 30 November).